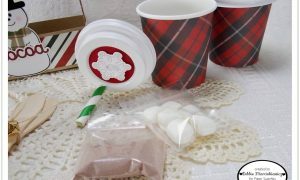 Kit contains: (1) 6" x 6" Mad 4 Plaid Photoplay Patterned Paper Pad, directions and templates to cut treat box, handle and bow, (1) 8 1/2" x 11" Kraft cardstock sheet, (2) wooden spoons, (2) jingle bells, (2) paper straws, (2) mini coffee cups, (2) mini coffee cup lids, (2) Marshmallow Sequins, (2) clear zip bags, twine, (7) pre-stamped images to create and decorate (1) treat box as pictured. (Note: you will have lots of patterned paper sheets left over after assembling this kit to use on additional projects. 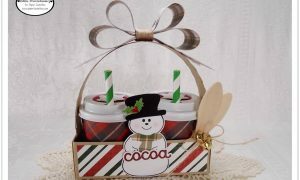 Stamps & dies used to create this kit: Snow Friends, Snow Friends Sweet Cuts, But First Coffee, But first coffee Sweet Cuts).